Foods like creamy risotto and chicken picatta are easy to prepare and comforting on chilly evenings. Fall is in full swing here in Northern California and I am loving all the amazing produce that I'm finding—especially squash! It's seasonal, simple to cook with, and inexpensive to boot. Plus, it's full of cancer-fighting antioxidants. Butternut squash is generally available from August to March, but it hits its seasonal peak in October and December. 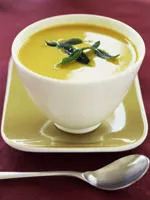 I tasted an amazing butternut squash soup at a local restaurant a few weeks ago and the recipe below is my easy adaptation. Foods like creamy risotto, chicken picatta, and homemade pizza are also easy to prepare, and they're comforting on chilly evenings. I find that people are intimidated by making risotto, but really it's incredibly simple to make and pretty foolproof. I actually enjoy the act of constant stirring at the end of the day because it clears my mind and helps me focus on one task at hand. Ask your kids to help you with the preparation—having them stir the pot is a fun and easy way to teach them a bit about nutrition. Serving this velvety soup with chicken sausage makes it a complete—and nearly effortless—meal. 1. Preheat oven to 375º. Drizzle squash with a small amount of olive oil and roast for about 30 minutes or until tender. Flip pieces halfway through. Set aside. 2. Heat the remaining oil in a cast-iron pan over medium heat. Add the onion and cook for about 10 minutes or until deeply caramelized, careful not to burn. The onion should be golden and fragrant. 3. Simmer chicken broth and, once hot, combine it as well as the squash and onion in a Vita-Mix or blender and process until smooth. Season with sea salt and pepper and add chicken sausage just before serving. Serving a poached egg on top is a classic Italian dish—the combination of runny yolks with creamy rice is to die for! 1. Heat the oil in a large pot on medium high heat. Add the rice and toss so each piece of rice has been coated thoroughly with the oil. Continue tossing for about 4–5 minutes or until the rice smells toasty and has turned the faintest shade of gold. Add the white wine and cook for 3 minutes. 2. Add the chicken broth, 1/2 cup at a time, to the rice, stirring continuously. Make sure every addition of broth has been soaked up before adding any more—this process will take a good 30–40 minutes, so be prepared! Once all the broth has been used and the rice is creamy and cooked, add the olives and cheese. Season with sea salt and freshly ground pepper. 3. Poach the eggs in an egg poacher or in simmering water with a tiny splash of vinegar. Top each serving of risotto with a poached egg and serve. Pizza is an easy family pleaser. Save money by whipping up some pies up at home instead of reaching for the take-out menu. 2. Heat oil in a cast-iron skillet over medium/low heat. Once hot, add onion slices and cook for 15 minutes or until deeply caramelized. Set aside. 3. Divide pizza dough into four small balls. Working with one ball at a time, flatten and shape into a circle. Top each circle with tomato sauce, cheese slices, a portion of the caramelized onions, and a sprinkle of fresh basil. Cook each pizza on a cornmeal-dusted pizza stone or baking sheet for 12–15 minutes or until the crust has puffed up and the cheese is bubbly. Serve immediately. A hearty, homey classic gets a healthy upgrade with brown rice and broccoli. 1. Heat the olive oil over medium-high heat in a large skillet or cast-iron pan. 2. In a large plastic bag, combine the flour, pepper, salt, paprika, and cayenne. Shake to mix. 3. Drench each pounded breast of chicken in the flour mixture and drop into the sizzling oil. Cook the chicken for about 10 minutes or until just cooked through. Remove and set aside on a plate to keep warm. 4. Deglaze the pan with the white wine. Add the lemon juice, lemon slices, and butter, and cook until the sauce thickens. Add the chicken back into the pan and add capers, coating the chicken on both sides with the sauce. 5. Serve with steamed broccoli and cooked brown rice.